This day began early because Lynda was coming in on “the red-eye special” from California, about 7am, having kissed Chuck good-bye at Camp Pendelton last night as he departed for Vietnam. I wanted to be right there at the door with open arms to meet her, but I begged Lyndon not to get up. “No, I want to,” he insisted. So the operator called us in what seemed the gray early morning and both of us were downstairs at the entrance to the Diplomatic Reception Room at 7 when she stepped out of the car. She looked like a ghost – pale, tall and drooping. We both hugged her and then we all went upstairs. I took her into her room, helped get her clothes off, and put her to bed. She’d had a sedative on the plane, slept a little, not much – and it was, I think partly emotion and partly the sedative that made her look so detached, like a wraith from another world. She said, “Mother, they were awful – they kept on pushing and shoving to get to us, and they almost ran over a child. And there were lots of other wives there, saying good-bye to their husbands!” She meant the press. When I went back to Lyndon’s room, his face was sagging and there was such pain in his eyes as I had not seen since his mother died. But he didn’t have time for grief. Today was a crescendo of a day. 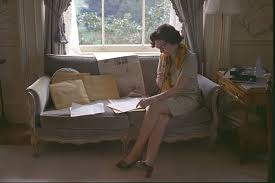 At 9 in the evening, Lyndon was to make his talk to the nation about the war. The speech was not yet firm. There were still revisions to be made and people to see. But he began to put on his clothes and got ready to go to church with Luci and Pat, something he does more and more often. The Reports, and your letter of the 25th have been duly recd. 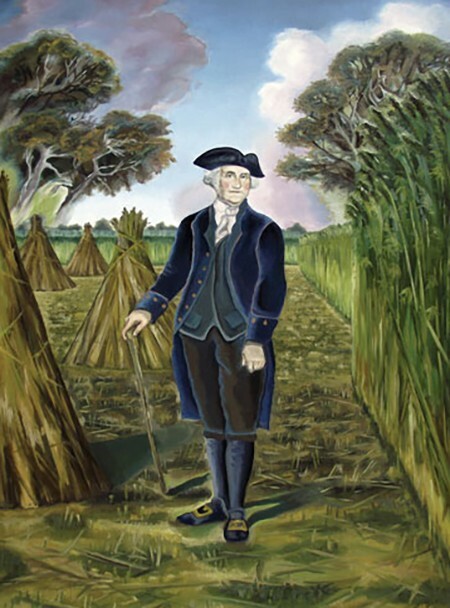 If you are satisfied from repeated trials, that the pieces of the treading floor at Dogue Run Farm, are well placed at an inch and half a part, it would be well to lay them all at that distance, that you may derive as much benefit as you can from it in the present Crop, and that it may be ready against the next year. The Oats might also be tread out on the same floor; and the sooner the better, as you will then know precisely the quantity which you will have to depend upon; and when known, inform me thereof. I have three and half bushels of a peculiar kind of Oats which I will send by the first Vessel bound to Alexandria: unfortunately they came to my hands too late for the Vessels which have lately departed from hence for that Port; but I would have you reserve and keep about two acres of ground in a good state of preparation for sowing the moment the seed shall reach you. I am sorry to hear your drilled and other Wheat makes but an indifferent appearance. I was in hopes such extreme fine weather as we have had during the whole month of March would have occasioned a pleasing change in both. As grain puts on different looks at this season, according as the weather, while growing happens to be, let me know from time to time how mine comes on. If it stands thick enough on the ground, such uncommon mildness & warmth as we have had since February, must have recovered that Crop greatly, as well as the Winter Barley. I doubted the Gardeners information at first, when you reported a pottle of St Foin seed; because the few plants could not bare so much; and next, because he did not take care in time to save what they did bare. Be the qty little or much, make the most of them & of the Hemp—and also the other seed he took for St Foin that you are able. Let Abram get his deserts when taken by way of example; but do not trust to Crow to give it him; for I have reason to believe he is swayed more by passion than judgment in all his corrections. All the labour that can be spared from more pressing & important work should be employed on the Mill Race; otherwise when the springs get low you will have no water for grinding; it being but a poor stream at best, and many leaks in the old part which will be avoided by the new, whilst those in other parts of the race should be carefully sought after, & effectually stopped. If my Sister Lewis of Fredericksburgh should send for it, let her have one of the unbroke Mules of middling quality and size. What Harry Truman didn’t realize at the time, but would soon find out, as he moved into the Executive Mansion, was that the very structure of the White House was about to fall on him as well. Shortly after moving in to his new residence, Truman started noticing signs that the building was under serious physical stress. He complained of drafts and unusual popping and creaking noises in the old house. When he wrote to his wife Bess, back home in Missouri, Truman often joked of the “ghosts” that inhabited the White House. 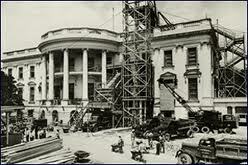 Early in 1948, in response to the President’s concerns, engineers confirmed that the White House was indeed in a serious state. Built in 1800, the mansion had been burned to the walls in 1814 (during the war of 1812), and then structurally compromised over the years by the additions of indoor plumbing, gas lighting, electric wiring, heating ducts, and major modifications in 1902 and 1927. The house was declared to be in imminent danger of collapse. The addition of a steel roof and full third floor in 1927 had added more weight than the building could handle. Wooden beams had been weakened by cutting and drilling for plumbing and wiring. The heavy ceiling of the East Room was found to be sagging as much as 18 inches, the marble grand staircase was about to fall down, the mansion’s plumbing was “makeshift and unsanitary” and the president’s bathtub was sinking into the floor. While the cost to just tear down and rebuild the White House was found to be cheaper than a full restoration, Truman deemed the ‘cultural’ value of the original structure more valuable than the cost savings of a tear-down. So in December of 1948, President Truman moved back into Blair House across the street and as a multi-year renovation that would cost $5.7 million was commenced. Crews began dismantling the interior, saving much of the wood trim, doors, and hardware for re-use. 126 new 25-feet-deep concrete columns were poured to provide support for the exterior walls. By the autumn of 1950, the White House was just a cavernous hollow space, 165 feet long, 85 feet wide, and 80 feet high. In a little more than 15 months a new White House was constructed within the walls of the original. A new steel framework was built to support all the interior rooms. New wiring, plumbing, ductwork, and other utilities were installed throughout the structure as concrete floor slabs and then interior walls began to take shape. On the evening of March 27, 1952, in a small ceremony at the entrance door, President Truman was welcomed back and presented with a gold key to the newly-renovated White House. After spending more than three years living in the Blair House a block to the North, the first family returned home. 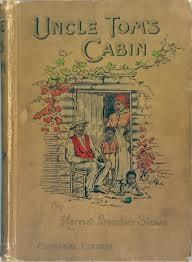 When I arrived at their camp I went directly to General Miles and told him how I had been wronged, and that I wanted to return to the United States with my people, as we wished to see our families, who had been captured and taken away from us. So General Miles told me how we could be brothers to each other. We raised our hands to heaven and said that the treaty was not to be broken. 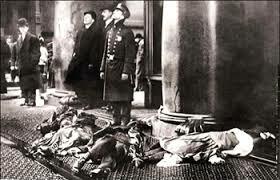 We took an oath not to do any wrong to each other or to scheme against each other. 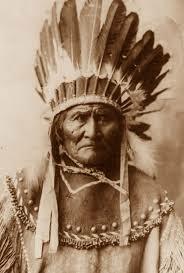 Then he talked with me for a long time and told me what he would do for me in the future if I would agree to the treaty. I did not greatly believe General Miles, but because the President of the United States had sent me word I agreed to make the treaty, and to keep it. Then I asked General Miles what the treaty would be. “I will take you under Government protection; I will build you a house; I will fence you much land; I will give you cattle, horses, mules, and farming implements. You will be furnished with men to work the farm, for you yourself will not have to work. In the fall I will send you blankets and clothing so that you will not suffer from cold in the winter time. My dressing room was near the elevator near Washington Place, so as soon as I took my pocketbook I had heard a girl holler “Fire!.” I wanted to turn my face so then I seen this girl- you know, she was a very jolly girl. She used to like very much to fool us, often saying “Here comes the boss,” “Here comes the floorlady”–and there was nothing. So when I turned my face and I saw she is the one, why than I didn’t pay any attention to her afterwards. Just continued my work in the dressing room. When I got near the dressing room, then smoke was coming up all around us, in my face and in all the windows, up by all the windows, so I wanted to run my face back. I saw flames coming up from the Greene Street side. I wanted to turn around to Greene Street, so instead of going to Greene Street the girls were crowded around that place waiting for the Washington elevator, because I seen all the girls were out at that Washington Place. They pushed me into the dressing room, so I could not see anything else. It got very dark and I felt a draft so I wanted to go out, so I seen some breezes coming out from someplace, so I wanted to make my way over to see where it came from. I seen it came from the Greene Street window. Near the Greene Street it was a window and there is was near the elevator, so I wanted to and made my way through the door I wanted. As soon as I pass I seen the examining tables were all burning. As I was passing by I seen smoke. You can see everything burning and I seen the rest of the girls remained in the dressing room, so when I passes the window I opened the window. The window, I saw, opened down, so I wanted to open the window. It opened double, and opened out, and so I burned my knee from the steam heat, so I turned back and stood there about two or three minutes. Of course it seemed more than four hours from me, but I knocked at the elevator that it should come up, and I seen- I turned my face and I seen the door was burning from the elevator – the door was burning from the doors, that door was burning in the factory, so I wanted to jump out of the roof, to go upstairs on the roof, so I burned my arm, my head, my hair and all, but I went on the roof and then some fellows from the Washington Place took me out together on the roof…. All the people what I left in the dressing room are all dead…. When the Second Virginia Convention convened at St. John’s Church in Richmond, Virginia in 1775 many of the delegates (which included Thomas Jefferson and George Washington) were unsure how to best assert their rights. Royal Governor Lord Dunmore had dissolved their House of Burgesses following its declaration of support for Massachusetts after the punitive Boston Port Act had been enacted by Parliament. “Gentlemen may cry peace, peace—but there is no peace. The war is actually begun! The next gale that sweeps the north will bring to our ears the clash of resounding arms! Our brethren are already in the field! Why stand we here idle? What is it that gentlemen wish? What would they have? 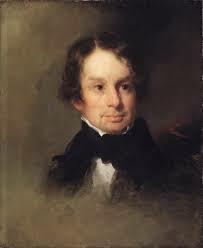 Is life so dear, or peace so sweet, as to be purchased at the price of chains and slavery? According to Edmund Randolph, the convention sat in silence for several minutes. 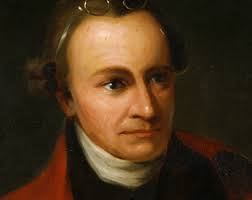 Then the resolution passed, and Henry was named chairman of the committee assigned to build a militia. Lord Dunmore reacted by seizing the gunpowder in the public magazine at Williamsburg. The war was on. The 1920s had not been kind to Las Vegas. It wasn’t much of a town to begin with, and the region’s mines weren’t producing much after the federal government halted silver subsidies and after the demand for zinc and tungsten plummeted with the end of the Great War. A railroad strike in 1922 prompted the Union Pacific to pull out its repair shops and there wasn’t much left. Las Vegas was so isolated that there didn’t seem to be any possibility it would grow. The depression was already setting in before the 1929 stock market crash. In 1930, with a population of 5,165, Las Vegas didn’t even have a traffic light, and the state assembly was desperate for new sources of revenue. On March 19, 1931, Gov. Fred Balzar signed legislation that legalized all forms of casino gambling and simultaneously enacted the most liberal divorce laws in the country. In short order the Northern Club opened in Las Vegas, and was soon followed by Binion’s Horseshoe, the California Hotel & Casino, the Fremont Hotel & Casino and the Main Street Casino. Reno, being an easy drive from San Francisco, became the national center for high-society divorces. “Bugsy” Siegel, who launched the Vegas Strip when he opened the Flamingo in 1946, was one of the first to benefit from the new laws when he was divorced there by his wife, Esther. By 1939 Hollywood had discovered the benefits of a six week residence in Nevada when Clark Gable came to Las Vegas to end his marriage to Maria Franklin. 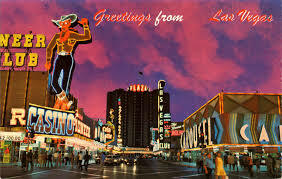 By the early 50’s the Sands Hotel had opened, the Rat Pack was in town, and neon lights lit up the strip until dawn. Nat Herreshoff was born and bred on the eastern shore of Narragansett Bay. He showed mechanical aptitude from an early age and graduated in three years from the Massachusetts Institute of Technology with a degree in mechanical engineering. After graduation he took a position with the Corliss Steam Engine Company in Providence and was delegated to oversee the 40-foot tall, 1400-horsepower dynamo which the company built to power demonstration machinery at the 1876 Centennial Exposition in Philadelphia. After the exposition closed Nat returned to Rhode Island and formed the Herreshoff Manufacturing Company in Bristol with his older brother, John Brown Herreshoff, and started to build boats. Nat provided the engineering expertise, while his brother J.B., who had gone blind at the age of 14, did all the cost calculations in his head, was responsible for negotiating with the firm’s clientele, and managed the business. The Herreshoff boat works quickly became renowned for building the fastest and finest steam yachts ever, in a wide variety of hull shapes. They paid their skilled craftsmen the highest wages in the state and the business burgeoned from about twenty employees to over 400. Nat Herreshoff was always tinkering and experimenting with new materials and inventive concepts and designs, seeking to create the fastest and finest boats in the world. Henry Ford is said to have visited the company’s works before he set up his first automobile plant and was particularly impressed with Herreshoff’s innovative use of interchangeable parts. 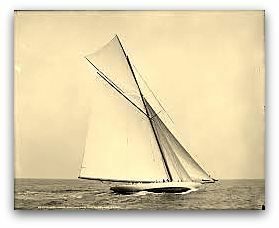 In 1888 Herreshoff was supervising speed trials of a 138-foot, 875 horsepower steamboat named “Say When”. After a safety valve released to relieve excess pressure, Herreshoff shut it back off so the boat could achieve maximum speed. A boiler exploded and fatally injuring a member of the crew, and Herreshoff lost his steam engineer’s license. After the steam accident, Captain Nat Herreshoff began focusing on sailing yachts. His designs were graceful, scientifically engineered, and speedy, and he built superbly crafted sailing yachts for Jay Gould, William Randolph Hearst, J. P. Morgan, Cornelius Vanderbilt III, and Harry Payne Whitney. During a 72 year career, Herreshoff designed and built five winning America’s Cup yachts: Vigilant (1893 – of which Herreshoff was the helmsman), Defender (1895), Columbia (1899 & 1901), Reliance (1903), and Resolute (1920). He designed well over 2000 craft and produced more than 18,000 drawings. He built the first torpedo boats for the U.S. Navy, and received the first patent for a catamaran sailboat (the Amaryllis, 1876). 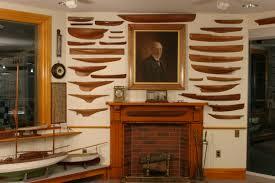 The range of boats designed by Captain Nat Herreshoff was vast and eclectic. The “New York 30” is widely considered among the finest racer/cruiser one-designs ever created. The 144-foot America’s Cup behemoth Reliance, which had a sail area of 16,000 square feet, could not have sailed from Bristol today as its mast would stand higher than the Newport Bridge. Perhaps his best loved boat was the simple “12½”, which many consider the best small boat design ever. Designed for the children of yachtsmen to learn how to sail, the boat is buoyant and stable, with a ballasted keel. The jib can be reached from the cockpit, the rig is small enough so a child can sail the boat, but it is still powerful enough that any sailor can enjoy its performance in the choppy waters of Narragansett Bay. immediately before England’s King George V and the Prince of Wales. The Herreshoff Marine Museum in Bristol RI, which occupies the site of the old Herreshoff Manufacturing Co., preserves Captain Nat’s legacy to this day.